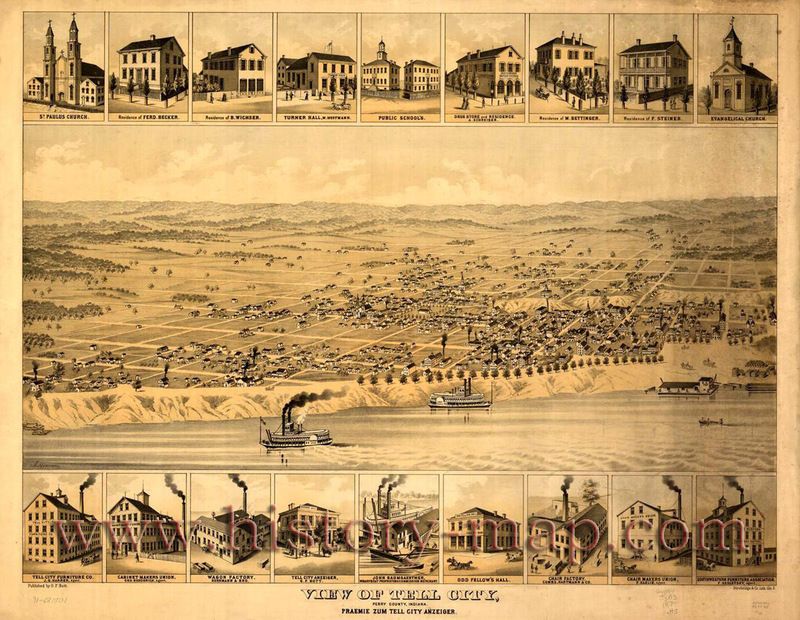 Tell City traces its 150+ year old roots to a meeting in Cincinnati, Ohio, in November 1856. A group of Swiss-German immigrants met there to organize a society known as the “Swiss Colonization Society.” Its purpose was to obtain affordable homesteads for mechanics, shopkeepers, factory workers and small farmers in a location where all could live in harmony. The Society decided to purchase a tract of land three miles (5 km) square to be surveyed into a city plot. The group sent out to purchase the land was told to keep in mind a healthful climate, fertile soil, good water, ample timber, and a location near a navigable river and a railroad, if possible. Purchase of such a site was made in July 1857. The tract, containing 4,152 acres (16.80 km2), was laid out in 392 town blocks with 7,328 building lots and 294 garden lots.Before the settlers arrived, a name for the new town was selected. Initially called Helvetia, it was soon renamed Tell City, a name easier to pronounce and remember for English-speaking people. It was named for the legendary Swiss hero and liberator, William Tell. Indicative of the foresightedness of Tell City’s founders are the wide streets. They are named for great persons of the military, arts, letters and science: DeKalb, Watt, Winkelreid, Steuben, Payne, Herrman, Reubens, Lafayette, Schiller, Tell, Fulton, Jefferson, Mozart, Franklin, Humboldt, Pestalozzi, Washington, Blum, and Guttenberg. With 100 years of recorded history, the citizens of Tell City held a centennial celebration August 10–17, 1958 in honor of the early settlers and the founding of Tell City. After the success of the Centennial, the Tell City Historical Society decided to sponsor a festival in 1959 to determine if the community would support it as an annual event. The festival, named Schweizer Fest (Swiss Fest), was a great success. Today, the festival remains one of Indiana’s longest-running community festivals.